Eleven houses near the Kinh Bridge in Ward 27 in Binh Thanh District of Ho Chi Minh City fell into the Thanh Da Canal on July 24, due to a severe landslide. A 70 meter long landslip along the canal swept away the whole of one house and it removed kitchens and foundations of ten other houses, said Nguyen Thi Thanh Hop, deputy chairwoman of the Ward 26 People’s Committee in Binh Thanh District on July 25. Right after the incident, the local government and policemen helped residents transport their possessions to safer shelters. According to Ms. Hop, two motorbikes, four refrigerators, three television sets, two air-conditioners and three karaoke machines fell into the canal. In addition, the government provided flats for homeless families and VND2 million each. The administrators forced 12 households in surrounding landslide- prone areas to evacuate to safer locations. Several hours of rain the night of July 24 and an extremely high tide caused the serious landslide, said Ms. Hop. 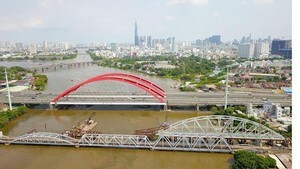 Phan Hoang Tri, deputy head of the HCM City Waterway Authority, said the company has placed warning signs to prevent ships and boats from traveling through the affected area. The HCMC Waterway Authority said it is waiting for the city’s provision of finance to construct canal embankments in the section where landslides occurred. 14 landslides occurred in districts of Ho Chi Minh City in 2009 including seven incidents in Nha Be, one in Binh Chanh, one in Cu Chi, one in Thu Duc, four in Binh Thanh, which swept away three houses, damaging two others; there was no report of human causalities. Of these, 40 are located along riverbanks and two are near the sea. The landslide-prone areas are sparsely located in many districts including 2, 4, 9, Binh Thanh, Thu Duc, Can Gio and Nha Be.